This update to Stacks 3 fixes a ton of bugs, a few crashes, and even adds a couple nice little features. 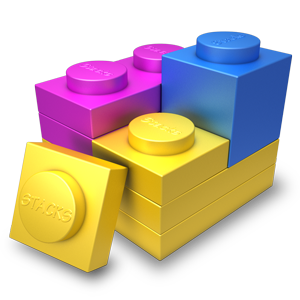 It's a free update and current users of Stacks 3 should see it show up in autoupdate next time they launch RapidWeaver. Here's a few of some of the big things we fixed. To see the full list, check out the complete Release Notes. We had a couple elusive crashers that we're really tough to find. One only happens when doing multiple-undo of very specific actions. And one only happens if you were using Mac OS X 10.9. In both cases Stacks should now run more more smoothly. A few folks with very large files with thousands of small stacks in their RapidWeaver document were causing Stacks to eat a lot more memory than it normally does. We've improved things a quite a bit for these folks -- and for the rest of us with more modest file-sizes things should just run a bit faster too. We know that some of you have corporate policies or an old piece of software that keeps you chained to an old OS. We've back-ported a few more of the missing features to 10.9 and fixed a number of bugs, both big and little. Most importantly, you should be able to update stacks more reliably and use the Library Groups bar to create custom groups. Add links to gif images. Support for "Relative to Website" urls. Check out the complete list in the Release Notes.